Amazon Web Service (EC2), as the name signifies, it offers a flexible cloud environment for all kinds of companies. Amazon gained edge over other Cloud provider because of its unique Cloud service concept. Its flexible features include Amazon Virtual Private Cloud (VPC), Elastic Block store (EBS), elastic IP address, Auto scaling, Amazon Cloudwatch, Elastic Load balancing and High Performance Computing Clusters (HPC). For 2012, Gartner ranked Amazon Web Services as a global Cloud leader in IaaS cloud business. World wide online community liked Amazon's unique Cloud concept. Amazon EC2 is very simple to use. 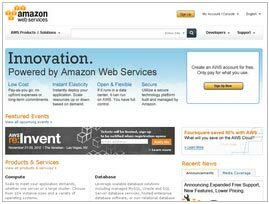 Users can start with a pre-configured Amazon Machine Image to start their operations immediately. With Amazon Elastic Block Store (EBS), users can collect large volumes of data at multiple memory zones. You can store data ranging from 1GB to 1TB without any hiccup. Amazon Virtual Private cloud (VPC) allows users to isolate different compute instances based upon different IP range. Amazon VPC allows clients to extend their network resources by connecting with AWS resources through a Virtual Private Network (VPN) or Internet. Amazon Cloud Watch gives total control to users over Amazon Cloud usage and charges. Users can keep a track on Amazon EC2 instances, Amazon EBS volumes, CPU utilization and Elastic load balancers. Amazon Cloud offers auto-scaling facility so that customers can get persistent Cloud experience, while Cloud instances fluctuate according to customer's requirements. Elastic load balancing offers fault tolerant incoming traffic to applications across multiple Amazon EC2 instances. Moreover, Amazon Web Services Cloud customers can use Amazon powered open platform “Eucalyptus” to design specific business solutions.